Cengage Learning Activity Series From aerobics and yoga -- to bowling, tennis, weight training, and more -- Cengage Learning offers a complete line of activities texts to meet your teaching needs. Written for individuals of all skill levels and backgrounds, the Cengage Learning Activity Series goes beyond the mere fundamentals, showing students how to improve, excel, and simply get more enjoyment from their favorite physical activities. 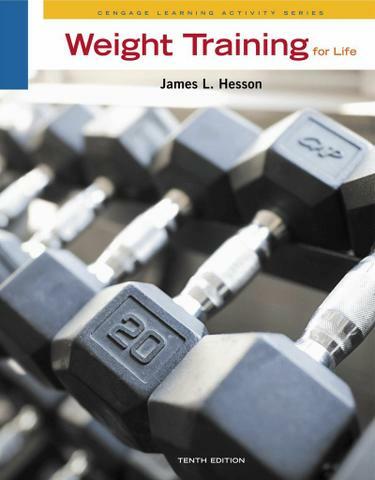 Practical, visual, and clear, the best-selling WEIGHT TRAINING FOR LIFE, Tenth Edition, prepares students to plan their own weight training programs for a lifetime of fitness. This text builds a solid foundation of current knowledge and practice in weight training for men and women of all ages and skill levels. It contains hundreds of full-color photos demonstrating exercises and proper techniques.